Scroll views act as the central coordinator for the Application Kit’s scrolling machinery, managing instances of scrollers, rulers, and clipping views. A scroll view changes the visible portion of the displayed document in response to user-initiated actions or to programmatic requests by the application. This article describes the various components of a scroll view and how the scrolling mechanism works. Cocoa provides a suite of classes that allow applications to scroll the contents of a view. Instances of the NSScrollView class act as the container for the views that work together to provide the scrolling mechanism. Figure 1 shows the possible components of a scroll view. NSScrollView instances provide scrolling services to its document view. This is the only view that an application must provide a scroll view. The document view is responsible for creating and managing the content scrolled by a scroll view. NSScrollView objects enclose the document view within an instance of NSClipView that is referred to as the content view. The content view is responsible for managing the position of the document view, clipping the document view to the content view's frame, and handling the details of scrolling in an efficient manner. The content view scrolls the document view by altering its bounds rectangle, which determines where the document view’s frame lies. You don't normally interact with the NSClipView class directly; it is provided primarily as the scrolling machinery for the NSScrollView class. The NSScroller class provides controls that allow the user to scroll the contents of the document view. Scroll views can have a horizontal scroller, a vertical scroller, both, or none. If the scroll view is configured with scrollers, the NSScrollView class automatically creates and manages the appropriate control objects. An application can customize these controls as required. See How Scrollers Interact with Scroll Views for more information. Scroll views also support optional horizontal and vertical rulers, instances of the NSRulerView class or a custom subclass. To allow customization, rulers support accessory views provided by the application. A scroll view's rulers don’t automatically establish a relationship with the document view; it is the responsibility of the application to set the document view as the ruler's client view and to reflect cursor position and other status updates. See Ruler and Paragraph Style Programming Topics for more information. A scroll view's document view is positioned by the content view, which sets its bounds rectangle in such a way that the document view’s frame moves relative to it. The action sequence between the scrollers and the corresponding scroll view, and the manner in which scrolling is performed, involve a bit more detail than this. Scrolling typically occurs in response to a user clicking a scroller or dragging the scroll knob, which sends the NSScrollView instance a private action message telling it to scroll based on the scroller's state. This process is described in How Scrollers Interact with Scroll Views. If you plan to implement your own kind of scroller object, you should read that section. 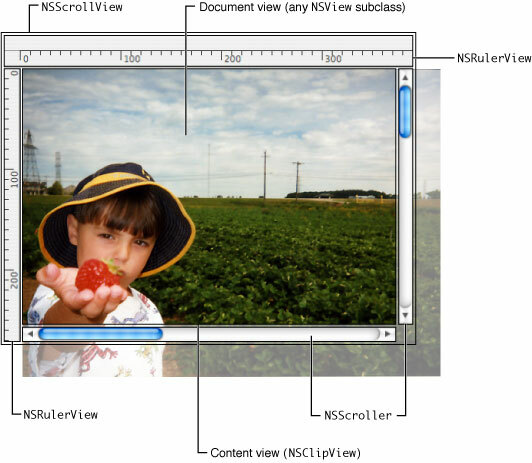 The NSClipView class provides low-level scrolling support through the scrollToPoint: method. This method translates the origin of the content view’s bounds rectangle and optimizes redisplay by copying as much of the rendered document view as remains visible, only asking the document view to draw newly exposed regions. This usually improves scrolling performance but may not always be appropriate. You can turn this behavior off using the NSClipView method setCopiesOnScroll: passing NO as the parameter. If you do leave copy-on-scroll active, be sure to scroll the document view programmatically using the NSView method scrollPoint: method rather than translateOriginToPoint:. Whether the document view scrolls explicitly in response to a user action or an NSClipView message, or implicitly through a setFrame: or other such message, the content view monitors it closely. Whenever the document view’s frame or bounds rectangle changes, it informs the enclosing scroll view of the change with a reflectScrolledClipView: message. This method updates the NSScroller objects to reflect the position and size of the visible portion of the document view. NSScroller is a public class primarily for developers who decide not to use an instance of NSScrollView but want to present a consistent user interface. Its use outside of interaction with scroll views is discouraged, except in cases where the porting of an existing application is more straightforward. Configuring an NSScroller instance for use with a custom container view class (or a completely different kind of target) involves establishing a target-action relationship as defined by NSControl. In the case of the scroll view, the target object is the content view. The target object is responsible for implementing the action method to respond to the scroller, and also for updating the scrollers in response to changes in target. As the scroller tracks the mouse, it sends an action message to its target object, passing itself as the parameter. The target object then determines the direction and scale of the appropriate scrolling action. It does this by sending the scroller a hitPart message. The hitPart method returns a part code that indicates where the user clicked in the scroller. Table 1 shows the possible codes returned by the hitPart method. The scroll view should not scroll at all. The scroll view should scroll down or to the right by the amount specified by the verticalLineScroll or horizontalLineScroll methods, dependent on the scroller's orientation. The scroll view should scroll up or to the left by the amount specified by the verticalLineScroll or horizontalLineScroll methods, dependent on the scroller's orientation. The scroll view should scroll down or to the right by the amount specified by the verticalPageScroll or horizontalPageScroll methods, dependent on the scroller's orientation. The scroll view should scroll up or to the left by the amount specified by the verticalPageScroll or horizontalPageScroll methods, dependent on the scroller's orientation. The scroll view should scroll directly to the horizontal or vertical location—dependent on the scroller's orientation—returned by the scroller's floatValue method. The target object tracks the size and position of its document view and updates the scroller to indicate the current position and visible proportion of the document view by sending the appropriate scrollers a setFloatValue:knobProportion: message, passing the current scroll location. The knob proportion parameter is a floating-point value between 0 and 1 that specifies how large the knob in the scroller should appear. NSClipView overrides most of the NSView setBounds... and setFrame... methods to perform this updating.